Due to increasing ridership, the Minnesota Transportation Museum decided in 1997 to look for a road locomotive to replace switch engine NP SW1200 105 as the primary diesel locomotive. An early-model GP was favored for its higher horsepower, more suitable suspension, and ability to operate in either direction. After a long search, Wisconsin Central GP-7 number 4159 was selected. The purchase was finalized on July 15th, 1998. Before being delivered to MTM, 4159 received its annual inspection at the WC's Fond Du Lac shops and a new paint job at the Wisconsin & Southern's Horicon, WI paint shop. It arrived in Osceola August 22nd, painted in Soo Line maroon and yellow and numbered Soo Line 559. 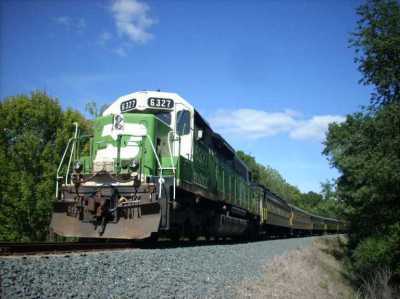 The Osceola & St. Croix Valley operates a section of the original Soo Line, which ran from Minneapolis to Sault Ste. Marie. In the 1950's, common passenger power on this line included nine GP-9 road-switchers from Electro-Motive. Soo Line GP9's 550 through 556 were delivered in Dec '54/Jan '55. 557 and 558 followed in '56 due to increased traffic. When delivered, they were painted maroon with a yellow band which widened into a "pine tree" design on the front. (Only Soo Line subsidiary Wisconsin Central GP9 2555, built double-ended in Jan '55, had a "pine tree" on both hoods. ) "S O O L I N E" was spelled out in yellow on the long hood, and the locomotive number below the cab windows. Interestingly, 558 pulled the final run of train 7 from Sault Ste. Marie to Minneapolis in 1960. Our GP-7 is portraying these Soo Line locomotives which called at Osceola. We selected the number 559 because it follows the series and can also be derived from its current number, 4159. The Soo GP9 2555 paint scheme with the "pine tree" on both ends was selected because the O&St.CV Ry runs 559 with either the long or short hood leading. In late 1951 the Rock Island purchased 25 brand new GP-7 locomotives, numbered 1213 through 1237. Destined for general-purpose work in the midwest, they had M.U. connections, small fuel tanks, no dynamic brakes, and no steam generators. They were painted in shiny black and crimson red, separated by white trim stripes, sported white "wings" on each end, and had silver trucks. EMD built them at their La Grange, Illinois plant, and delivered them in October through December of 1951. The Rock Island liked the GP-7s. By the end of GP-7 production in May 1954, they owned 128 - the most of any single model on their roster. Our GP-7 was built in November of 1951 as Rock Island 1223, builder's number 15182. Two photos in Robert P. Olmstead's book, taken in 1952, show very narrow fuel tanks, single-chime air-horns mounted on the sides of the hoods, on opposite corners from the cab doors, and M.U. recepticles mounted about two feet above the platform on each side of the walkway between locomotives. Sometime in 1960 the 1223 was involved in a serious wreck. It was returned to EMD to be rebuilt in kind, and returned in February 1961. This time it was painted in maroon instead of the white "wings", crimson, and black, although the white pin-stripes were retained. Because the original frame was used, it is considered the same locomotive. However, much of the superstructure was redone. When purchased by MTM, the maroon paint and later white & blue showed beneath the C&NW green and yellow, but the original crimson and black was not found. Based on visual inspection, it appears not to have been repainted between its 1961 and 1976 rebuilds. A 1962 photo shows it had a winterization hatch, single-chime air horns atop the hood, fore and aft of the cab, and a full-width fuel tank. M.U. recepticle location was unchanged. In 1974 the Rock Island had so many worn-out locomotives they were frequently short of usable power. New locomotives were too expensive, so it was decided to rebuild the old GP-7, GP-9, and GP-18 locomotives. Because the Rock Island did not have the shop capacity, a deal was swung with Precision National. PNC would take ownership, rebuild the locomotives, and lease them back to the Rock Island. The work was actually performed by Morrison-Knudsen in Boise, Idaho, PNC in the Rock Island's Silvis, Illinois shops, or PNC in the Illinois Central Gulf's Paducah, Kentucky shops. It was originally planned to number the GP-7s in the 4400 series and the GP-9s in the 4500 series, but reality intervened. 1223 was to become the 4446, but when it actually returned to service on February 19, 1976, it was the 4505. Like the rest of the PNC rebuilds, it wore the new "THE ROCK" colors of light blue on the long hood and cab, and white on the short hood and frame. The external appearance was largely unaltered by the rebuild. External changes were mainly limited to the removal of the footboards, re-shaping the cut levers to be more easily accessible from the steps, and the addition of four rooftop access hatches over the prime mover. Many locomotives also lost their EMD builder's plates in the rebuild. Presumably the M.U. recepticles were changed to one each end, at platform height on the same side as the cab door. ROCK 4505 in freight service with RI U33B 198 in Chicago, IL on April 8, 1976, two months after rebuilding in Silvis, IL. When the Rock Island was liquidated by the bankruptcy court in March of 1980, PNC retained ownership of the geeps it had rebuilt. PNC did not need them for leasing, and soon found a buyer. In 1981 the Chicago & North Western purchased 109 GP-7s. They were given official C&NW paint jobs, renumbered 4100 through 4209, and placed in service. ROCK 4505 became C&NW 4159, entering service on April 26, 1981. This photo was taken about a year later. Note the snow plow pilot on the front. It was presumably added by the C&NW. This photo shows C&NW 4159 in service in Green Bay, WI on July 26, 1983, about two years after being placed in service by the C&NW. It still has the old style spark arrestors and is without all-weather cab windows. In 1988 the C&NW spun off some Wisconsin trackage to new regional Fox River Valley. 4326, 4501-4506, 4508-4510, & 4514. O&St.CV Ry. Prior to delivery it was given its annual inspection by the WC's Fond Du Lac shops and then sent to the Wisconsin & Southern for repainting into a Soo Line livery authentic to the line through Osceola. The WC brought it to Withrow on Friday, August 21st. Saturday morning the MTM crews took posession. This photo and the photo at the top of this page were taken Sunday the 23rd. During the 2001 operating season, MNTX 559 was sent to the BNSF Northtown Diesel Shop for work on one of its trucks. This work was performed on a volunteer basis by MTM member / BNSF Northtown diesel electrcian John Peters. This view shows MNTX 559 coupled to BNSF SD45-2 6486 at BNSF's Northtown Yard on August 28, 2001 before returning to MTM. EXTRA 2200 South Oct/Nov/Dec 1971; Early Geeps, roster and technical data p7-14. October 1982 issue of Mainline Modeler; Article on GP-7's. March 1983 issue of Trains; Article on the demise of the Rock Island. June 1995 issue of Trains; Article on GP-7's, fold-out drawing of Rock Island "wings" paint scheme. 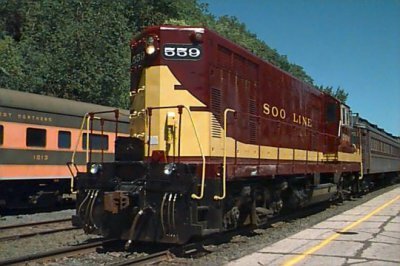 Spring 1997 issue of The SOO; Article on Soo Line GP-9's. Various issues of MTM's "Minnegazette"; Photos and references to WC GP's at Osceola. "Enginemen's Operators Manual - Model GP7 - Aug '51 Edition," by EMD; data. "Diesels of the Chicago & North Western," by Paul K. Withers; data. "Rock Island Diesel Locomotives," by Louis A. Marre; photo p111, data p109-113,120-127,130. "Rock Island in Color Volume I 1948-1964," by Lloyd E. Stagner; photos p35. "Rock Island Recollections," by Robert P. Olmstead; RI 1223 photos, p35-36. "The Second Diesel Spotter's Guide," by Jerry A. Pinkepank; production totals and general GP-7 data p52-56. "Trackside around Chicago 1957-1965 with George G. Speir," by Edward M. DeRouin; photos of maroon and gold Soo GP9 2555 p123. Classic Trains "GM's Geeps The General Purpose Diesels," by Paul D. Schneider; drawings and photos of GP7's, GP9's, and GP18's. Model Railroader CYCLOPEDIA-Volume 2 DIESEL LOCOMOTIVES, by Bob Hayden; EMD Model GP7 p112-115. SD9 6234 was donated by the Burlington Northern and Santa Fe Railway Company on September 12, 2003 and the BNSF delivered the 6234 to the Jackson Street Roundhouse in St. Paul on October 16, 2003. This SD (Special Duty) road switching locomotive is a significant addition to the Museum’s collection since it is ideally suited for light rail applications (passenger, freight, and switching service), and readily lends itself to secondary and branch line operations. When offered to MTM, BNSF 6234 was known to have an undiagnosed ground fault, but to be in otherwise excellent condition. In late 2003 the ground fault proved to be a dead short in the main generator. In 2004 airbrake, body, and mechanical work were done, and BN 6234 enjoyed successful test runs around MTM's Jackson Street Terminal. Pleased with its performance, the shop released the 6234 for service on the Osceola & St. Croix Valley Railway's passenger operations during the 2005 season. It has run well, taking turns with Soo GP7 559 as the road engine. Sometimes the two are MU'd and run together. BN SD9 6234, built by the Electro-Motive Division (EMD) of General Motors as C&S 839 (CB&Q subsidiary Colorado & Southern), was among the last SD9s produced before EMD started SD18 production. A total of 471 SD9s were produced by EMD between 1/54 and 6/59. C&S 831-842 builder date 4/59 (the first group of New Burlington Route locomotives to be painted in the "Chinese" red scheme), DM&IR 159-174 builder date 4-5/59, and Reserve Mining 1225 (the last SD9 built) builder date 6/59 were the last SD9s produced. These 29 SD9s are Phase IV units and the only SD9s built in 1959. Phase IV SD9s are identified by a taller battery box and have the GP9 style high short hood and cab which produced a noticeable drop from the cab roof to the long hood. C&S 839 as delivered in the Burlington Route “Chinese" Red and gray paint scheme had a 16-567C prime mover rated at 1750 H.P., D12 main generator, D14 alternator, D37 traction motors, dynamic brakes, two 48” radiator fans with winterization hatch, dual headlight housings on the front of the locomotive with the top unit a Mars oscillating safety light, dual control stands (BN later removed the left-side control stand), and EMD’s 3-motor 6-wheel FLEXI-COIL trucks. C&S 839 is shown at Cheyenne, WY September 7, 1968. The 45 degree black and white Scotchlite striping along the frame was applied in 1965 for safety reasons. The CB&Q and its subsidiaries C&S and FW&D, along with the GN, NP, and SP&S Railways, were merged to form the Burlington Northern Railroad (BN) in 1970. In 1971, C&S 839 was repainted BN “Cascade Green” and black with white lettering and nose stripes but without the BURLINGTON NORTHERN lettering, and retained its C&S identity by sub-lettering C&S on the cab sides below the BN cab logo like C&S 842 at Teague, TX January 22, 1972. Later small C&S initials appeared above the number boards on both ends of the unit with BURLINGTON NORTHERN lettering under the BN cab logo and the C&S initials moved to the battery box/tool box covers. C&S 839 is shown at Ft. Collins, CO December 25, 1977, and note that it still has its Mars light. Ed Fulcomer, Ralph Back Collection, from the Estate of John Herrick, Courtesy Barry Moore. C&S 839 was renumbered C&S 6234 and finally renumbered into the BN system as BN 6234 in 1979-80 losing its C&S identity (C&S lost its corporate identity on December 31, 1981), and its Mars light was also removed sometime around this time. BN 6234 is shown at Ft. Collins, CO November 24, 1983. With the merger of the Atchison, Topeka, and Santa Fe Railway (ATSF) and the Burlington Northern Railroad (BN) into the Burlington Northern and Santa Fe Railway (BNSF) in 1996, BN 6234 was patched with the BNSF corporate initials as its reporting mark and was assigned BNSF number 6148 in the BNSF re-numbering plan but only received the BNSF reporting mark without receiving its assigned BNSF number before being donated to MTM. The BNSF renumbering plan has all SD9s in the 6100-6198 number series. Patched BNSF 6234 as delivered to MTM shown at the Jackson St. Roundhouse Oct. 17, 2003. CB&Q subsidiaries Colorado & Southern and Ft. Worth & Denver extended the reach of the Burlington Route from Colorado and Wyoming to the Gulf of Mexico. BN 6234 served the C&S, BN, and BNSF locomotive fleets for more than forty-four years with its maintenance assignments Denver, CO up to the BNSF merger and Galesburg, IL after the BNSF merger. It still retains its as-built high-hood SD9 appearance with only a few minor external changes: Mars light housing on the front of the locomotive removed leaving only the lower headlight, front and rear pilot foot boards removed, ditch-lights added to the front and rear walkway decks, and front and rear steps changed from four-steps to five-steps. Of the original 12 C&S 1959-built SD9s 831-842, 10 were still shown as active on the BNSF roster as of April 30, 2003, and that included BNSF 6234. "EXTRA 2200 South" September-October 1969; SD9 Model Roster p25. "The Second Diesel Spotter's Guide," by Jerry A. Pinkepank; SD9 production data p71. "Burlington Northern 1971 Motive Power Annual," by F. Hol Wagner, Jr.; C&S 839 photo p25, C&S SD9 roster p77. "Burlington Northern 1972 Annual," by F. Hol Wagner, Jr.; C&S SD9 roster p96, Assignment of BN Locomotives p100. "Burlington Northern 1973 Annual," by F. Hol Wagner, Jr.; C&S SD9 roster p115, Locomotive Assignments p123. "Burlington Northern 1975-76 Annual," by F. Hol Wagner, Jr.; C&S SD9 roster p134, BN Locomotive Maintenance Assignments p143. "Burlington Northern 1976-77 Annual," by F. Hol Wagner, Jr.; C&S SD9 roster p171, Locomotive Maintenance Assignments p183. "Burlington Northern 1977-80 Annual," by F. Hol Wagner, Jr.; SD9 roster p175. "Burlington Northern 1980-1991 Annual," by Robert C. Del Grosso; SD9 roster p155-156, BN Power Assignments 1991 p208. "COLORADO & SOUTHERN Southern Division -Color Pictorial-," by Ed Fulcomer; BN 6234 photo p88, many excellent photos of C&S SD9s 831-842 in "Chinese" red. "Burlington Northern Santa Fe 1996 Motive Power Annual," by Bill Shippen; photo of BN 6237 (C&S 842) p85. "Burlington Northern Santa Fe 1998/1999 Motive Power Annual," by Bill Shippen & Joe Shine; photo of BNSF 6131 (C&S 840) p132. "Burlington Northern and Santa Fe 2003 Locomotive Review," by Robert C. Del Grosso; SD9 roster data p79-80, photo of BNSF 6136 (C&S 842) p79. Thanks to Ed Fulcomer of Ft. Collins, CO for the use of his original Kodachrome transparencies for scanning and use in this Web page to document the color schemes of C&S 839 and BN 6234. In May 2009, the BNSF Railway donated SDP40 6327 to the Minnesota Transportation Museum. She was built in 1966 as Great Northern 325 for passenger service between St Paul, MN and the Pacific Northwest. The Great Northern railroad believed that passenger trains were the window through which the public viewed them. It should either be keep washed and cleaned, or shut altogether. Although jet air travel and the new interstate highway system had encroached on patronage and profits, and some railroads had terminated all passenger service, in 1966 the GN's main passenger trains were still viable. One problem was the passenger locomotives. Averaging over twenty years old, they were costing more and more to keep in good repair. In May 1966 the GN purchased six 3000-hp SDP40s for the Western Star and connecting trains to Vancouver, BC and Portland, OR. They were numbered 320-325, used EMD's new improved 645 diesel engine, and were painted in "simplified" orange and green Empire Builder colors. Havre, MT was their assigned maintenance base. Around the same time, the railroad's own shops created ten steam heat cars which allowed freight locomotives to substitute on passenger trains. Finally, in 1967 the GN purchased eight 3600-hp SDP45s for the Empire Builder, which were numbered 326-333. 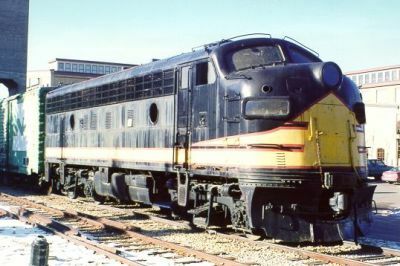 The SDP40, passenger version of the SD40, contained a Vapor-Clarkson steam generator in an extended long hood that is flat instead of tapered. Vents are present along the side of the steam generator area. The SDP40s were built especially for the GN, and the GN was the only US railroad that purchased the SDP40 model. Only 20 were built, six of GN and 14 for NdeM (National Railways of Mexico). In 1967 the Great Northern embarked on a corporate re-imaging program. Working with St Paul design firm Lippincott & Marguiles, they modernized their logo, adopted the Helvetica typeface for lettering, and corporate colors blue, grey and white - known as Big Sky Blue. The SDP45s were delivered in blue, and all the SDP40s except 323 were eventually repainted. Change came again in March 1970, when the Great Northern, Northern Pacific, Chicago Burlington & Quincy and Spokane Portland & Seattle merged to form the Burlington Northern. The new corporate logo and colors of green, black and white - known as Cascade Green - were designed by the same design firm who had created Big Sky Blue and are very similar. In fact they kept the Helvetica typeface. In the merger, GN 320-325 became BN 9850-9855. Those numbers derive from the Burlington's practice of numbering passenger locomotives. More change arrived in May 1971, when BN transferred its passenger train operations to the newly-formed quasi-Government National Railroad Passenger Corporation - Amtrak. Although BN sold a number of passenger cars to Amtrak, they retained the SDP40s and SDP45s. The steam generators were removed and, redesignated model SD40 by the BN, the SDP40s were again renumbered - this time to 6394-6399. 9855 became 6399 on April 15, 1974. One SDP40 - former GN 323 which never wore Big Sky Blue - was distinguished by being painted in the "Bicentennial" red/white/blue scheme as BN 1976 from 1975 to 1978, in celebration of the United States's 200th birthday. Former GN 325 - MTM's loco - became similarly distinguished in 1989 when BN repainted it with a white cab front and large logo on its nose. This variation of Cascade Green, designed for increased visibility and safety, has been nicknamed the White Face paint scheme. The ex-GN SDP45s were retired in the mid-1980's, during a purge of all V20-powered F45, SD45 and SDP45 locomotives. GN 333/BN 6599 alone survived, in modified form, as a road test of an experimental four-axle self-steering radial truck design. In 1995, the Burlington Northern and the Santa Fe merged to create the Burlington Northern Santa Fe Railway, later known simply as BNSF. Two SDP40s, GN 321 and 322, were already gone. 322 was wrecked and scrapped in 1984, and 321 sold to Montana Rail Link (it survives today as their rebuilt "SDP40-2XR" 290.) GN 320/BN 6394 was owned by BNSF for a year before being scrapped in 1996. That left GN 323-325 to be renumbered BNSF 6325-6327 in 1998. Ex-GN 323 (the "Bicentennial" 1976) was sold to NRE and is now in the Alstom lease fleet as GCFX 3093 painted in an all-white scheme. It has been rebuilt, losing much of its distinctive steam generator compartment and vertical rear steps. Thus BNSF 6326 and 6327 became the final two locomotives on the BNSF to have started life as passenger units. 6326 (nee-GN 324) is actually still on their roster, but has been stored out of service for many years. Interestingly, it's identifcation has been changed to GN 6326 to make way for new locomotive purchases. That left 6327 as the last active passenger unit, until it was retired in June 2008 after 42 years of service and then only due to a surplus motive power situation. It was en route to Galesburg, IL when the retirement order came down. By the time it was moved to Topeka, KS for disposition, it had already been earmarked for donation to MTM. BNSF 6327 still retains its as-built low-hood SDP40 appearance with only a few minor external changes: head light relocated from between the number boards to top of low nose (the only one so modified,) steam generator equipment and roof apparatus removed, ditch-lights added to the front walkway deck, and nose classifications lights removed and plated over. Great Northern 325, as delivered in simplified Omaha Orange and Pullman Green. Sister locomotive 322 exhibits the "Big Sky Blue" colors which were introduced in 1967. Burlington Northern 6399 in the White Face variation. Ed Fulcomer photo. The chief distinguishing features of an SDP40 are the steam generator enclosure at the rear with its absolutely flat end, the vertical rear steps, and the rear walkway which is cantilevered over the coupler. "The Second Diesel Spotter's Guide", by Jerry A. Pinkepank; p77-79. "Great Northern Color Pictorial - Vol II", by Joseph W. Shine; p47-49. "Burlington Northern Locomotive Directory 1993", by Robert C. Del Grosso; p65. "Burlington Northern Railroad Locomotives 1970-1996", by Robert C. Del Grosso; p173 and p213. "Burlington Northern Diesel Locomotives", by Paul D. Schneider; p44, 127, 131. "The History of the Burlington Northern", by Bill Yenne; p115. 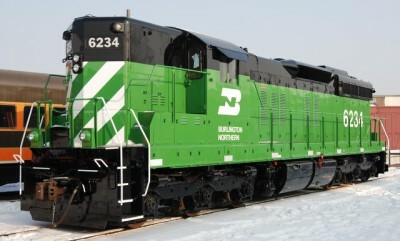 "Burlington Northern... Into the 90's", by Joseph W. Shine; p178. Thanks to Ed Fulcomer of Ft. Collins, CO for the use of his original Kodachrome transparencies for scanning and use in this Web page to document the color schemes of GN 325. Jackson St. roundhouse St. Paul, MN on July 19, 2007. Great Northern HUSTLE MUSCLE SD45 400 is owned by the Great Northern Railway Historical Society and is on indefinite custodial loan to the Minnesota Transportation Museum. GN 400 was stored at the Lake Superior Railroad Museum in Duluth, MN until mid-December 2000 when GN 400 made the trip from Duluth to St. Paul. GN 400 is kept at MTM's Jackson St. Roundhouse located in St. Paul, MN, and is in operating condition. Some of the following information was provided by the GNRHS. See Sources below for additional information. GN 400 was the first 3600 horsepower turbo-charged 20 cylinder 645E3 production model SD45 diesel electric locomotive manufactured by General Motors Corporation (EMD). GN 400 was the first of eight SD45s (GN 400-407 all delivered in the GN Omaha orange and Pullman green simpified scheme) in between May and June 1966 to the Great Northern at its Dale Street Shop in St. Paul, MN. GN 400 was christened HUSTLE MUSCLE by the Great Northern Railway. In 1970, this locomotive was renumbered Burlington Northern 6430 but still in the original GN green/orange scheme. The GN logo was removed from the cab sides and small white BN sub-lettering was added below the white 6430 road number on both sides of the long hood. In September, 1973 BN 6430 underwent Class One repairs at Livingston, Montana and was repainted in the BN Cascade green scheme. At the request of numerous railfans and employees, BN 6430 retained its HUSTLE MUSCLE nickname. In 1986, BN 6430 was retired and donated to the Great Northern Railway Historical Society. In 1989, BN 6430 was repainted to its original GN 400 paint scheme at Grand Forks, ND. In November 2006 GN 400 received a new coat of paint a second time at the Wisconsin & Southern Railroad's paint shop in Horicon, WI. This time, the HUSTLE MUSCLE lettering was applied in the correct postion centered in the orange area above the road number and GREAT NORTHERN lettering on each side of the long hood. On the first restoration painting the HUSTLE MUSCLE lettering was incorrectly centered beneath the dynamic-brake housing. When BN 6430 was repainted in the Cascade green scheme, the HUSTLE MUSCLE lettering was centered beneath the dynamic-brake housing. A number of modifications were made to GN 400s original appearance (Dale St. shops St. Paul, MN September 1967 - GNRHS collection). These modifications included the addition of ditch-lights below the front walkway, coupler lift-bars with loop on both ends of the locomotive, additional MU-receptacle on the front and rear walkways, winterization hatch and the three rear hood radiator grilles are painted orange. GN SD45 400 was delivered with trucks with two brake cylinders mounted "low and inside" hanging between the axles on each side of the truck. Southern Pacific received SD45s in August-September 1966 and their experience revealed brake performance problems with the original delivered HD Flexicoil trucks which GN 400-407 also had. EMD's response was the addition of supplemental brake cylinders. Sometime after 1972 GN 400 received the modification of a supplemental brake cylinder mounted "high and outside" on the truck frame. This modification was made to each truck with the supplemental brake cylinder mounted on the front truck on the conductor's side and the rear truck on the engineer's side - right front and left rear. The photos below labeled Before Repaint (front truck conductor's side) and Rear View (rear truck engineer's side) clearly show these supplemental brake cylinders mounted "high and outside" on the truck frame of GN 400. "Burlington Northern 1973 Annual" by F. Hol Wagner, Jr., Motive Power Services 1973. "GREAT NORTHERN Motive Power Review Color Pictorial - Volume 2 -" by Joseph W. Shine, FourWaysWest Publications 1993. "SOUTHERN PACIFIC HISTORIC DIESELS VOLUME 12 EMD SD45 LOCOMOTIVES" by Joseph A. Strapac, Shade Tree Books 2005. Thanks to Ed Fulcomer of Ft. Collins, CO for the use of his original Kodachrome slide for scanning and use in this Web page and the Summer 2007 issue of the MINNEGAZETTE to document BN 6430. This F7 beauty, formerly located at Bandana Square in St. Paul, has been donated to the Minnesota Transportation Museum. It is former Burlington Northern 668, originally Great Northern 454A. It is a significant addition to the museum's collection, since it is one of a handfull of surviving Great Northern cab units, and chances are good it was serviced at the museum's former GN Jackson Street Roundhouse - where it resides today. GN 454A was built in March, 1950 by the Electro-Motive Division of General Motors, builder's number 9544. It was the first unit of a matched A-B-B-A set (454A,454B,454C,454D) built for freight service. Internally, it was powered by a 16-567-B prime mover, a diesel V-16 which produced 1,500 horsepower. The complete four-unit set was thus a 6,000 horsepower locomotive, roughly equivalent to contemporary steam locomotives. Estate of John Herrick, Courtesy Barry Moore. "Great Northern Color Pictorial Volume 1", by Joseph W. Shine; GN 454A photos p69 and p74. "Burlington Northern 1976-77 Annual", by F. Hol Wagner, Jr.; BN 668 photos p108-p110. "Burlington Northern 1980-1991 Annual", by Robert C. Del Grosso; BN F7 dispositions p179. 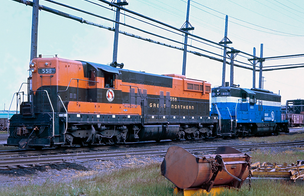 "GREAT NORTHERN In Color Volume 1: Lines West", by David H. Hickcox; GN F7 A-B-B-A 454D,454C,454B,454A photo top of p15. In November 2017 Cargill donated this time capsule. GN 558 is an original-condition “Special Duty” six-motor version of EMD’s popular GP7 Road Switcher. Designed for either heavy pulling duties or for navigating flimsy branch lines, the SD7 sold first and best in the upper Midwest. Leader EMD was actually last to market. This niche was owned by Baldwin, with Alco and Fairbanks-Morse their competition. EMD had a reputation for reliability, so when they introduced the SD7 customers took notice. Orders came from the Milwaukee Road, Great Northern, the Burlington, the Chicago & North Western, and the Minneapolis & St Louis. Some western railroads bought the SD7 and a few sold out east, but the upper Midwest was its stronghold. ‘Authority For Expenditure’ was approved on October 30th, 1951. Delivery was from May to October 1952. The Milwaukee ordered first but production overlapped, so 558 is among the first twenty six-motor locomotives EMD ever built. To create the SD7 the designers stretched the four-motor GP7. Differences included a longer & deeper frame, access covers all along both sides of the frame to hide air piping and electrical cabling, grouping all radiators at the rear, and greater fuel/water capacity. The greatest innovation was bringing their ‘Flexi-coil’ truck to the US market. It was a radical new design – soon to end the traditional drop-equalized suspension design in locomotives. Fans spot the SD7 by the inset lights on either side of the headlight. (Compare with SD9 6234). Designing the classification lights and number boards to be changed from outside the locomotive was unique and never repeated. Sharp eyes may notice the battery boxes on either side of the electrical cabinet. This unusual location was common to both the SD7 and the SD9. (They were moved very late in SD9 production, including 6234). The GN bought options for cold winters: A duct for routing hot air from the radiator into the engine compartment and an oil-fired stand-by heater. Unlike most railroads, they always ordered their road switchers with the long hood as the front so 558’s cab floor plan is turned 180 degrees from normal. EMD sold four SD7 sub-models. 558 is an SD7RL, meaning 24-RL air brakes and a light frame. It could instead have had older 6-BL air brakes or extra weight for better traction in heavy drag applications. The fifteen SD7s always called Minnesota their home. Some also served a little further west, but all were strangers to the west coast. In the mid-1960’s, the GN added large pedals and radio-based devices to detect when the Engineer fell asleep. If caught napping, the equipment would stop the train. 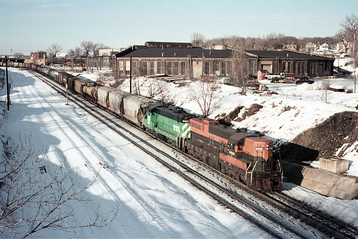 On March 2nd, 1970 the GN, NP, Burlington, and SP&S joined to form the Burlington Northern Railroad. The four had been financially related since the days of James J. Hill and had in fact attempted to merge on four previous occasions, only to be denied by the government. 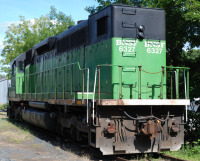 Now a BN locomotive, 558 was painted in the new corporate Cascade Green colors and assigned number 6008. 6008 retained its assignment to Superior, WI for maintenance, yet it was frequently photographed on yard-to-yard transfer jobs in the Twin Cities as well. In 1983, all of the SD7s, GP7s, F7s, E8s and older switchers were retired in a general purge of locomotives with 567B or older prime movers. (31 years is double the expected service life). Most went to scrappers for recycling but 6008 and 6009 were purchased by Cargill. Cargill used 6008 at their grain elevator in Litchfield, MN. After that elevator closed, 6008 moved in 2016 to Pipestone, MN but was not used there. Declaring it surplus, Cargill approached MTM about donation. MTM plans to exhibit 558 in as close to “as-built” appearance as possible, with occasional operation just to keep the machinery in good working order. It is the first Midwestern SD7 preserved. 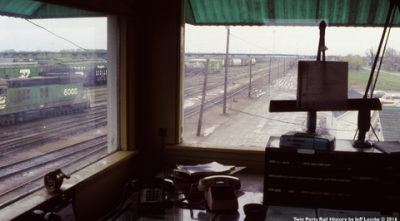 Seen from the 17th Street yard tower in Superior, WI on May 29, 1983. 6008 is facing imminent retirement. In February 1972, former GN SD7s 6008 and 6005 roll downhill past the old Northern Pacific Mississippi Street roundhouse in St Paul, MN. Interstate 35E now occupies this site just east of MTM’s Jackson Street Roundhouse. Notice that 6008 is leading but is running backward. That’s the fireman twisted around in his seat to see where they’re going. Home base: The Great Northern Belknap Avenue roundhouse in Superior, WI. Very close to the Allouez ore docks. July 1969. 558 has by now been repainted in the “simplified” orange and green.